Come on and join me. 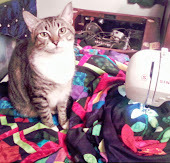 I have the day off and I WILL SEW for me !! Hi MaryK, I have tagged you in a blog-tag game. Hope you will join in.